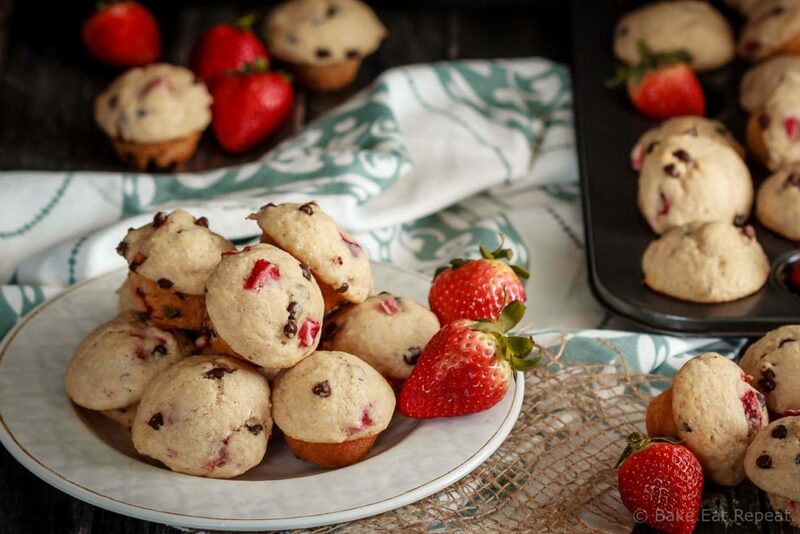 These cute little mini strawberry chocolate chip muffins are quick and easy to make and taste great. Plus they’re healthy enough that you can easily have more then one! We make so many muffins around here. We’re baking them at least once a week, usually more often then that. And if I’m not making them, my kids are! I’ve found muffins are such a great thing for the kids to bake themselves as they’re pretty hard to mess up. They somehow manage to make the kitchen a complete disaster, but hey – at least there are muffins to eat while we clean it up! Muffins are just so handy to have on hand – everyone likes them, and they make such a great on-the-go breakfast or snack. Plus you can mix up a batch in minutes and there are so many options for flavours. Basically they’re the perfect option for breakfast. 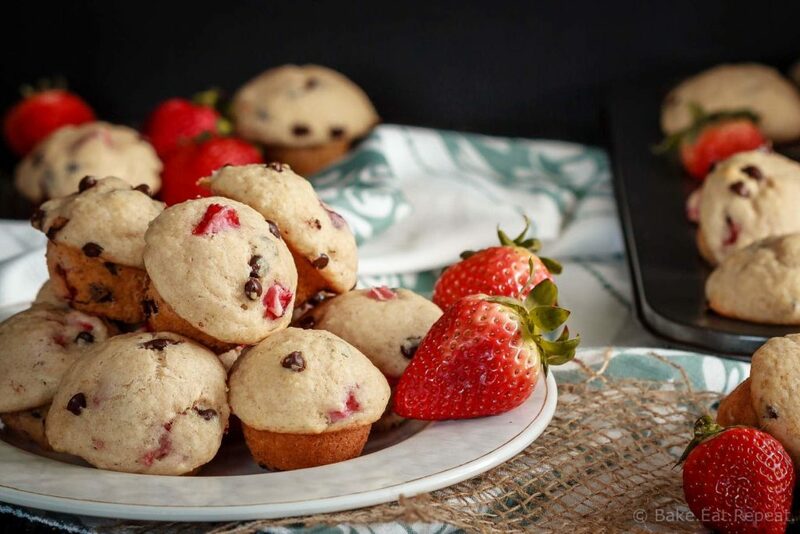 These mini strawberry chocolate chip muffins are light and fluffy and filled with sweet pieces of fresh strawberry and mini chocolate chips. They’re also healthy enough that I don’t feel bad about having more then one – or letting the kids do so! It’s the perfect snack to pop into their lunch boxes for school – healthy enough to give them some energy but sweet enough they feel like they’re having a treat. That’s the perfect snack in my mind – we’re both happy with it! The other thing that I love about muffins is that they freeze well, if you don’t go through multiple batches of them every week like we do. I know not everyone is a muffin fanatic! Pop them in an airtight container or a ziplock bag once they’ve cooled and they’ll freeze well for up to 3 months. 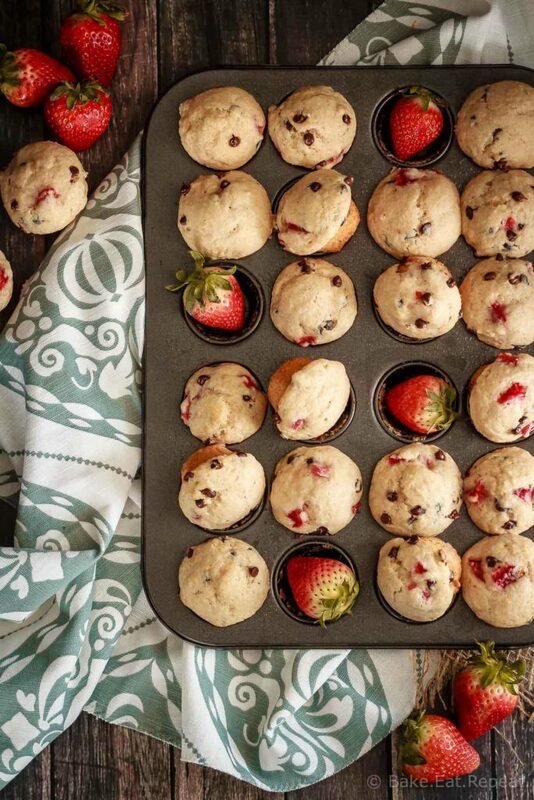 We loved these mini strawberry chocolate chip muffins – they disappeared in no time! 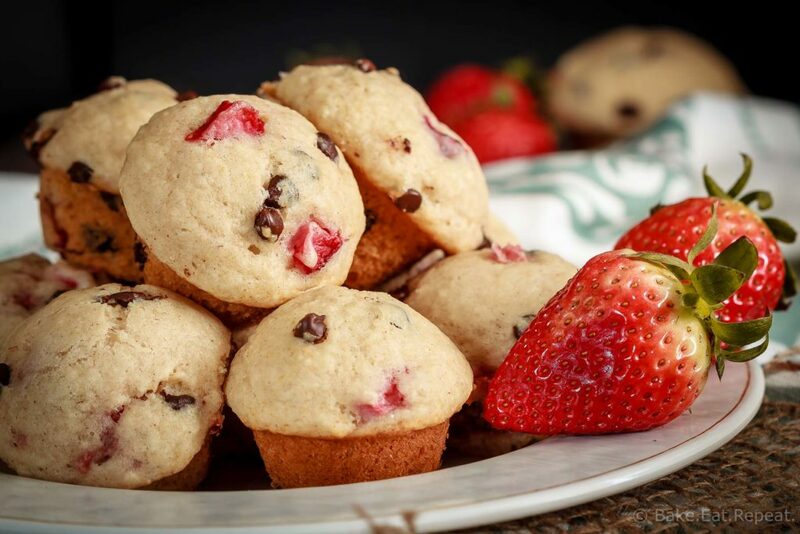 I’ve also shared this Mini Strawberry Chocolate Chip Muffins recipe over on Food Fanatic. the strawberry chocolate chip mini muffins say 1 1/2 tsp of baking powder in the recipe and under the directions it says it says whisk flour baking soda and cinnamon together. which is it baking powder or baking soda? Yikes - sorry about that, it's baking powder. I changed some things when I was working on this recipe a little while ago, and missed that when editing it. Sorry, I'll get that changed ASAP! Thanks! I am trying these today for sure!